Postcard collectors will not be astonished to hear that all cards pretending to show Charles de Lambert nearby the Eiffel tower during the flight, are the result of trickery or composition, as nobody knew something beforehand. One however, according to the experts, might have been taken by an amateur who found himself by chance on the second platform of the Eiffel Tower that evening of Monday October 18 1909. Publicity seizes the unique flight. The department stores ‘Au Bon Marché’ issues a series of cards picturing aviation pioneers with their aeroplane and some biographical data Henry Farman, Charles de Lambert, Hubert Latham, Louis Paulhan and Wilbur Wright. The singing community closes ranks and an old ‘hit’ is for the hundredth time relaunched. “Didn’t you see de Lambert, has he drowned in the sea, has he lost his way in the desert?”. 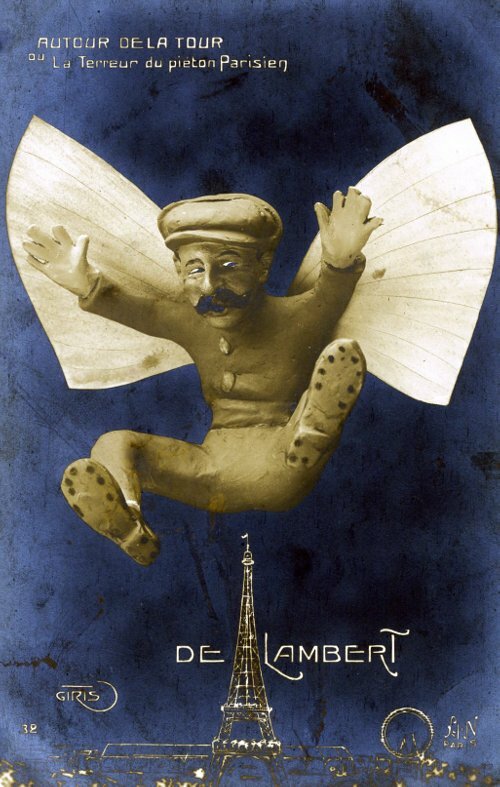 Not only French caricaturists are inspired in the beginning of the 20th century by the flight around the Eiffel Tower of Charles count de Lambert. Thursday November 4 2004, intensively occupied with historical research on the initial stage of aviation, writer of this, seeking diversion of a different kind, visits the Van Abbemuseum in Eindhoven, The Netherlands. Amongst the cubist works from the beginning of the twentieth century he comes, completely surprised, face to face with the painting, oil colours on canvas, L’équipe de Cardiff of Robert Victor Félix Delaunay. The image of the Eiffel Tower, a biplane and especially the lettering ASTRA – name of the Société de Constructions Aéronautiques being the producer in France of Wright machines – cause him to spend much time in the library of the museum where he finds an explanation. 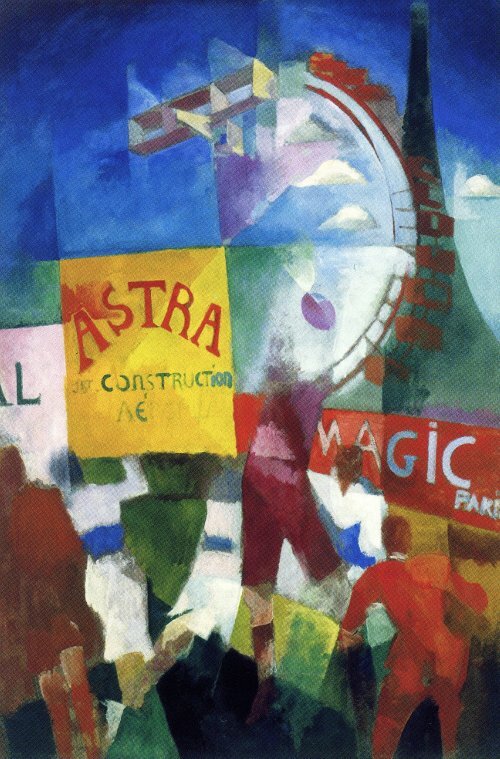 It is known that Robert Delaunay, together with his wife Sonia Delaunay-Terek – a Jewish-Ukrainian artiste – as well as Pablo Picasso and Georges Braque were among the many artists, poets and intellectuals in Issy-les-Moulineaux who watched with astonishment and admiring eyes the airplanes.